For decades, the residents of the southern Appalachian Mountain region (roughly consisting of parts of Georgia, North and South Carolina, Tennessee, Virginia, and Kentucky) lived their lives untouched to a great extent by the world around them. They developed their own music (derived to some degree from the traditional music of their ancestral homes in Ireland, Scotland, and Great Britain). Expressions of Christianity took on a variety of forms from Episcopalian to Baptist, from traditional preaching and baptism in a river to snake-handling (only in a few more isolated regions of the area), from hymns to gospel songs and shape-note singing. These folks had to rely mainly on what they could produce in the way of food and goods from folk medicines to moonshine. As the world around them began to encroach more and more upon their region, the way of life and culture began to change and become more like the wider communities around them. A need to preserve the information and traditions became apparent and was (in part) fulfilled by a high school class assignment. In 1966, a teacher at the Rabun Gap-Nacoochee School in northeast Georgia put a challenge to his bored high school students: gather and write stories about the regional traditions and practices, covering both the bygone days and the current ones still living on. Out of this beginning came a series of publications written by students, including The Foxfire Magazine (begun in 1967) and a series of books (the first volume was published in 1972) that complied articles originally published in the magazine. In addition, a number of companion books have been published from time to time. 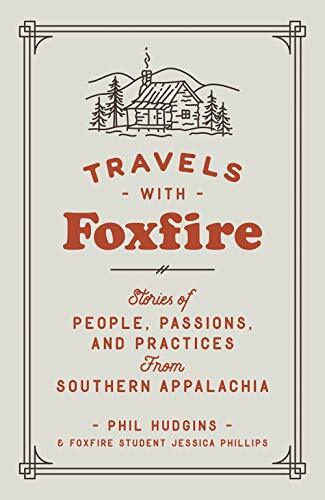 Travels with Foxfire carries on the tradition and provides a bridge to a more modern-day way of life. Such stories as the revival and restoration of a drive-in theater in Rabun County, Georgia, give both a feel for the drive-in theater that was and an enjoyable story about how this entertainment venue can be revitalized and expanded to fulfill other local needs. Moonshining has always been a part of southern Appalachian culture. From its introduction to the region in the early 1800s to the present day, stories of the production of “white lightnin’” are part of the folklore of the mountains. Because they paid no taxes on the product, the private sale of moonshine was (and still is in many places) illegal. The home-made product is often very contaminated with a variety of materials (usually lead from the solder used on the condenser), often making it very hazardous to consume. The stories in Travels focus on some of the people involved in the business of moonshine production and distribution, giving an enjoyable, and sometimes humorous, behind-the scenes picture of this piece of southern folklore. An accompanying article on the origins of NASCAR stock car racing explains the somewhat shady origin of this popular sport from the need for fast cars that could outrun the “revenuers” (Federal ATF agents). Unfortunately, Travels is lacking in some respects. The detailed descriptions of how to create things is often missing. While Travels devotes eight pages to a few stories about moonshining episodes, The Foxfire Book (volume one of the original series) spends 45 pages (complete with photos and diagrams) on the construction and operation of a still. Traditional music gets somewhat better coverage. Travels focuses primarily on vocal music (both secular and religious), focusing to a great extent on personalities and performers, whereas the original volumes (such as Foxfire 3 and Foxfire 6) deal in some detail on the construction of various types of dulcimers and banjos. The authors may have felt it unnecessary to repeat much of the detail found in earlier volumes, but some material on current instrument producers and changes in technique would have proved informative. Other topics covered in Travels include hunting, recipes (worth trying at home), and outhouses (this article written by a “priviologist”—yes, there is such a thing). The book serves as a useful addition to the Foxfire body of literature and furnishes some transitions from an older way of life to a modern setting.